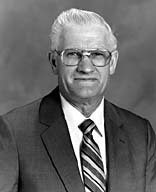 Waldo Pratt Call served as a General Authority of The Church of Jesus Christ of Latter-day Saints. At the time of his call to serve in the First Quorum of the Seventy, he was presiding over the Uruguay Montevideo Mission. He served first in the First Quorum and then in the Second Quorum and was released on October 6, 1990, soon after he began serving as president of the Mexico City Mexico Temple. He has also served as Scoutmaster, bishop’s counselor, high councilor, stake president, and regional representative. He was born in Colonia Juarez, Mexico, on February 5, 1928. He is a descendant of early Church leader Parley P. Pratt. He obtained a bachelor’s degree in agronomy and horticulture from Brigham Young University. He taught a variety of subjects at the Juarez Stake Academy and had orchards and a farm in his home town. He and his wife, Beverly, are the parents of seven children. This page was last edited on 4 April 2017, at 10:54.